The nose has the bitterness you get from vegetables, spices, and flowers. The taste starts very bitter, then is balanced by malt, just short of sweetness; finally there are hints of mandarin zest, hop shoots, and olives. Light, champagne-like carbonation with a lingering bitterness in the finish. 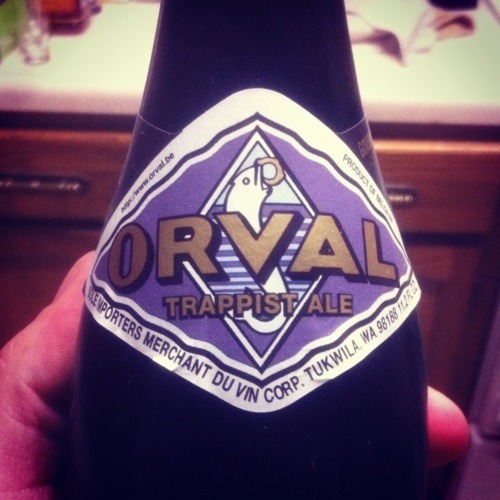 There is a lot of talk about Trappist beers. It’s a cool concept… beers that are made by monks, within a monastery that produce $0 in profit. All of the money made either goes back into the brewery/monastery or is donated to charity. Now that is what I like to call drinking for a purpose! It’s just funny to me to think that monks made this. Seems wrong. Oh well, I have heard great things about this beer… so let’s see. It is the only beer this brewery makes, so it better be tasty! In the Glass: There were a TON of bubbles when I poured it into the glass, but it quickly settled. It has a crisp, clean, and carbonated look to it in the glass. It is compared to a champagne-like carbonation, so I will try to keep an open mind here as I try this famous beer. Nose: It doesn’t smell like beer, that’s for sure. It smells like flowers. No, I’m serious… smell this and tell me you don’t get a big nose full of flowers. It also has a somewhat dry sweetness to it too… I wonder what she tastes likes. Flavor: Those bubbles are NOT on the tongue, that’s for sure. There is a sublet bitterness at the start, that leads to a dry finish and then the hops sort of kick in toward the middle back half of the palate. Then it’s gone. Not sure what the fuss is about here… this beer is just OK.
Mouthfeel: When I poured it, there were tons of bubbles. I assumed there would be a ton on the tongue. There weren’t. I am not saying that is a bad thing. It doesn’t really taste like beer, either. The mouthfeel is smooth, silky, then dry as it quickly disappears on the back of the tongue. Aftertaste: What aftertaste? There really isn’t one. All of the flavor happens in the middle as you swallow, then it’s gone. The burp is pretty weak too. Come on monks… you can do better than this! The bottle is cool… saddle, the best part of this beer. That, and the history behind it. Past that, skip it. There are better beers out there. The first thing I have to say about tonight’s beer is that it had a LOT of head in the glass. Ricky tried to pour it, and we had to sit and wait on all the foam to go down. It was literally two glasses full of just foam at first. So there’s that. The beer smells like cinnamon and honey to me. It’s obviously very carbonated and bubbly. It almost reminds me of the look and smell of mead. I hope it tastes just as good. The color in the glass is almost a strawberry honey color. It looks slightly thick, but not too much. It is still somewhat transparent. Let’s find out how it tastes. The beer is VERY carbonated. That is the first thing you taste when you drink it. The bubbles hit your tongue with force. There’s practically no taste, just bubbles. Once you get past that, it has a bit of a honey taste, along with some bitterness. This is all very much mixed in among the bubbles. They are really hard to get past. It is not the taste I expected. Even seeing all the foam, I didn’t quite think it would be so carbonated. It almost tastes like some kind of soda, even close to the taste of carbonated water. The flavor is decent, but the carbonation is just to hard to get past to enjoy what might be there. Not likely one I will purchase again. In collaboration with Moon Valley Nurseries, the Arizona Craft Brewers Guild will feature 40 stunning locally sourced trees in its indoor rustic festival décor this Saturday, July 23, 2016 at the Phoenix Convention Center.